On my recent first visit to Belgium, I spent two incredible nights in the romantic town of Bruges. I stayed at the award-winning Eco-Hotel Fevery Brugge which was super cosy, great value for money and had the friendliest service. 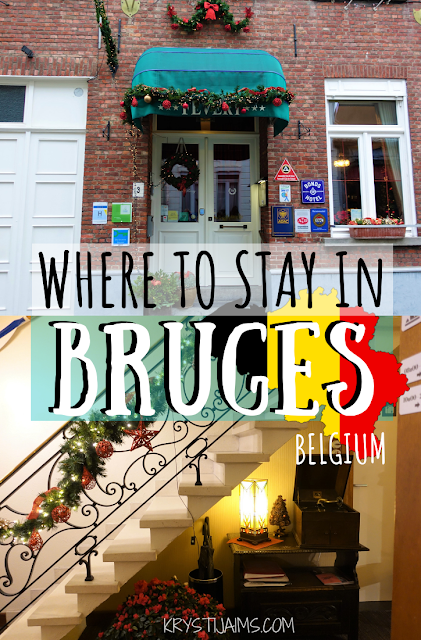 If you are heading to Bruges yourself, then this family-run hotel is a perfect choice. Hotel Fevery is located in a charming and quiet area, only a few streets away from the Market Square. My partner and I took a taxi from the train station as it was raining, but it's easy to catch a local bus there or parking is available too. The hotel is in a quaint brick building and walking in I immediately got a cosy and homely feel about it. I loved that inside and out, it was decorated for Christmas, much like the rest of the town! At the reception area, I was warmly greeted by the owner Paul, who immediately presented us with welcome Belgian chocolates, yes please! He gave us a map of the city with top suggestions of things to do and also recommended a few good local eateries and pubs nearby. (We especially loved Vlissinghe, the oldest pub in Bruges). Paul then kindly took our luggage and showed us to our room on the top floor. Our room was the Comfort Double M+, which was very quiet and looked over the courtyards and gardens of the neighbourhood below. The queen sized bed was very comfortable and the overall sleep quality was excellent. The furnishings included two cosy armchairs set around a square table, a small fridge with coffee making facilities provided, a double wardrobe with a safe, and a luggage rack. Set on the wall opposite the bed, was a flatscreen TV and on the door was a full-length mirror. Being winter, the heating was also adequately sufficient. The ensuite bathroom had a bath and shower, as well as a hairdryer and eco-friendly toiletries. I liked that you were encouraged to use less water and reuse your towels. Other features of the spacious room included excellent high-speed Wifi, USB plug sockets and daily housekeeping. Simple in design, the room had everything we could want for and it was the perfect base to explore Bruges from. There are different sized rooms available to suit your needs, whether you're a solo traveller and after a smaller room or a family wanting larger, connecting rooms. On the ground floor to the right of the entrance is a most welcoming lounge area. Here between 8 am and 10 pm you can relax and sip on a complimentary coffee or tea, or enjoy a famous Belgian beer available from reception. Presented on a silver tray, the beers were very well-priced and my partner and I took advantage of this one afternoon when the rain was relentless. In the summer you can rent bicycles directly from the hotel which would be the perfect way to discover the countryside. A lovely daily breakfast is included in the room and it was a fantastic start to each day. It was a classic European variety with cold meats, cheese, a large choice of fresh bread, fruit, yoghurt and cereals. The star of the show was the most perfectly boiled egg I've ever had, and the jug of freshly-made hot coffee and orange juice was the icing on the cake. I was very impressed with Hotel Fevery and would 100% love to stay there again on my next visit to Bruges. Being so close to the town centre, yet in a quiet and picturesque area was incredibly ideal. I loved the unique character and charm of the family-run hotel, which so many hotels and chains just lack. Paul was extremely hospitable and helpful with any recommendations and is more than happy to help make your stay as comfortable as possible. It's a perfect choice for all kinds of travellers, from families and couples to solo travellers. The price is very affordable for such a comfortable stay in a great location. The cosy and clean rooms, friendly service and delicious breakfast made it an absolute pleasure to stay there and I highly recommend it to anyone passing by the historical and beautiful town of Bruges.